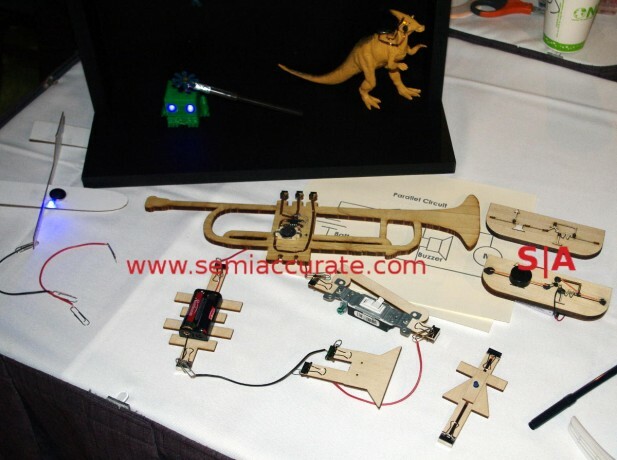 One of the most interesting things at Siggraph so far has been the conductive stickytack by Conductak. 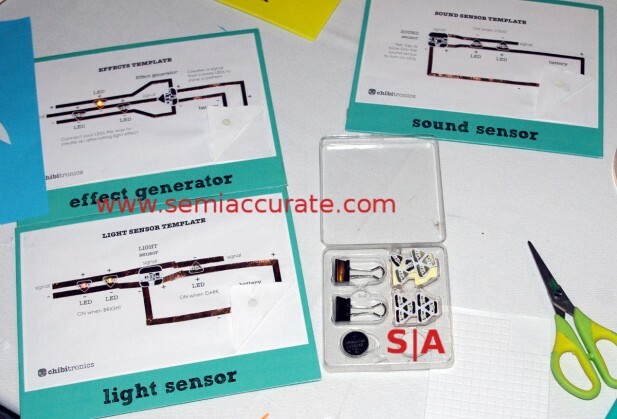 Coupled with Circuit Stickers and AgIC’s conductive ink, there are some cool projects you can design. The idea is simple enough, take that blue sticky putty that you use to put posters on walls with and make a conductive version. That is what Conductak makes, they have a brown tacky putty that conducts electricity. If you have a couple of traces you want to put an LED between, put two globs of Conductak on it and press it on. It sticks and you have a functional connection. It isn’t that complex to explain but the doors it opens are. If you are thinking, “Shut up and solder it”, you are probably not the target market. It could be useful to have a glob of this around your lab for odd jobs and more frequently practical jokes, but that misses the point. If you are teaching kids how to design circuits or get them interested in Arduino type projects, this is a very safe and low burn quotient way to get them involved. It is perfect for schools too. As you can see from the projects above, you aren’t going to be making superscalar deeply pipelined OoO thingies with this stuff. What you will do is make electronics cheap, accessible, and safe to a whole new audience. If you look at the laser cut and embossed boards under the logo above, you can also see another potential audience, vision impaired geeks. If you can’t see it is really hard to solder so doing anything with electronics is orders of magnitude harder, molten metals are not a suitable material for braille. Conductak and embossed guides could change all of that. 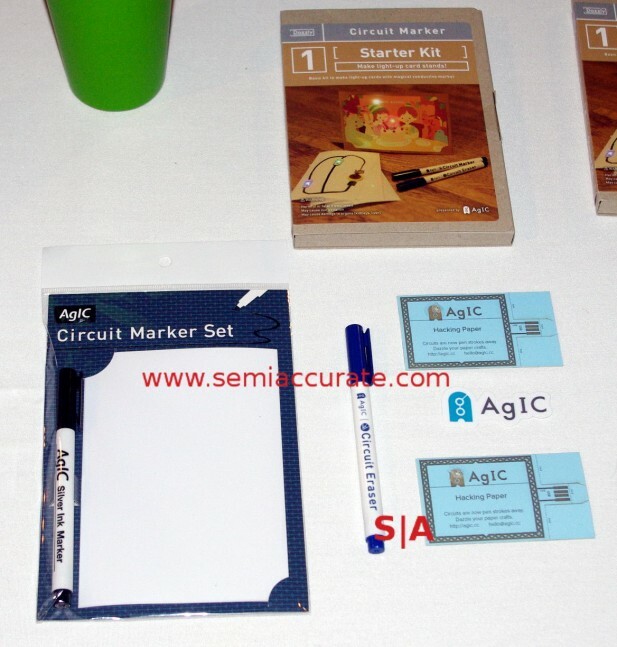 AgIC to the rescue with pens that draw using conductive ink. It looks like a pen, writes like a pen, and more germane to the target audience, probably does not taste much like a normal pen. That said you can draw traces to put stickers and Conductak on with AgIC’s pens. It is almost like magic but with more science. AgIC also can print stuff with their ink on an actual printer to achieve much finer results. If you look at the blue business cards by the pen, they are actually USB templates. On a paper business card, not a PCB one that is 3-4mm thick. This one has some possibilities doesn’t it? It may not change the world but it could be very useful and people won’t forget the card you hand them.